Making sound investments is tough enough without having to worry about unscrupulous financial advisers and outright frauds. But recently strengthened laws aren’t enough to stop the “professionals” intent on profiting from—or just plain stealing—your money. With gripping stories of actual cases, Huddleston sheds light on the dark corners of the investment industry and teaches investors and professionals alike how to spot fraud and guard themselves against financial catastrophe. Being taken advantage of in my investments isn't something I've been concerned about, despite AIG and Bernie Madoff and Lehman Brothers and all the other stories you read. I thought my investments were safe because we use major companies like Fidelity and Vanguard for our retirement funds. I'm probably pretty safe, given that we're currently only investing in target date funds instead of individual stocks, but I learned from this book how truly simple it is for a rogue broker to take advantage of even that situation. This book is written for the smart layperson - someone who has enough money to invest a little, but who is not only clueless about the prospect but embarrassed to admit that he or she is clueless. The case studies vary from the mundane (a broker starts out trying to cover up a mistake and it spirals out of control) to cases of repeat offenders (including some guys who themselves keep getting scammed and losing their marks' money!) to the truly outrageous (Bernie Madoff), and are interesting. They read like thriller stories. None of the content is dry at all, and yet I still feel like I learned a ton. The book starts out with an explanation why even smart people - maybe especially smart people - fall for scams, frauds, and deals that are too good to be true. As with most financial situations, it's 90% psychological - the con man flatters you to the point that you don't want to admit that you don't understand what he's talking about. The author then goes on to explain in detail the way a number of different scams work, including how the con man makes money off of you, so that you can recognize the scam for what it is and ask the pointed questions that will scare off the scammer. He then goes into the securities industry and why the existing oversight infrastructure often fails to protect investors from scammy brokers. He repeatedly encourages the vigilant investor to report scams (with instructions for how to do so) to protect future investors. The end of each chapter details steps that the vigilant investor can take to do their due diligence on an investment opportunity or a broker. The steps are broken down in plain English and even provide scripts for passing up a high-pressure deal or cold-call. The book ends with a focus on watching out for the baby boomers who are now the most likely to be scammed out of their retirement savings as they get older. The script for talking to older parents about money was particularly good, and while it will be a couple years before I need to have those conversations with my own parents, maybe I can start having conversations with them now that won't make that such an awkward experience for both of us. Overall, I found this book very informative and helpful. However, most of the advice focused on catching an already rogue broker AFTER something had happened to your money, like an unauthorized trade or something like that. I wish there had been a chapter on "how to check your current investments and make sure they're in the best position possible". 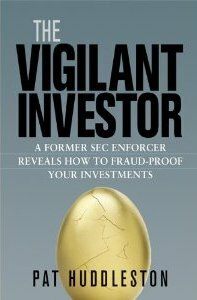 I'm also not entirely clear whether mutual funds like target date retirement funds are as susceptible to fraud as regular stocks, and I wish there'd been a section to clear that up (I am assuming they are not, because I feel like this book was really thorough and would otherwise have addressed that). Bottom line: if you're currently doing ANY investing in stocks, bonds, annuities, or anything in the stock market, this is mandatory reading. And if you're at all planning to someday have enough money to invest, this is strongly recommended reading.